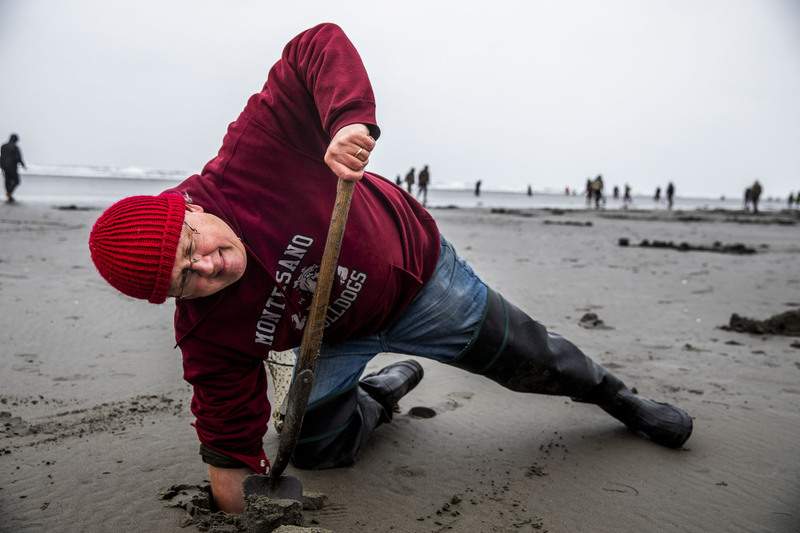 Dan Ayres reaches into the sand for a razor clam during a public dig at Grayland Beach State Park on Jan. 2, 2019. Ayres says his favorite part of digging for razor clams is when there is a little bit of a struggle. “This is more satisfying when you have to work at it. The hunt. Especially when you’re not finding many,” Ayres says. “I have firsthand experience of that fire people have in their gut for getting out and digging razor clams,” he says. That fire is shared by roughly 250,000 to 400,000 other razor-clam diggers who visit the Pacific Coast every year. That’s almost four times more than Puget Sound hardshell clam fishery, the next biggest recreational shellfish fishery in Washington. From October to May, between 3 million and 6 million razor clams are harvested each season. The Fish and Wildlife Department tries to offer at least one week of digging each month during the season, but it all depends on the health of the state’s clam population. That’s where Ayres comes in. Parts of his job include analyzing health and assessing razor-clam population size, setting dates for public digs and keeping track of how many razor clams are harvested each year. Outreach is part of it, too: He made a popular instructional video with a colleague about how to dig for razor clams. Ayres says it’s important for him to keep razor-clam digging accessible to everyone. “It is a terribly gratifying feeling every time I see someone want to try for the first time,” Ayres says. Ayres said being out working on the beach during digs is his favorite part of the job. Some folks recognize him as the “clam guy” and stop him to ask questions or tell him about their own experiences digging. One family who saw him on the beach during a public dig told him they found his instructional video online and came to dig for the first time because of it. Most of the clam diggers Ayres encounters are families out for a bit of seaside fun. But he knows from experience that, for some, razor clams are a method for supplementary nutrition — even survival. To get through the Great Depression, Ayres’ grandfather would dig for razor clams with his buddies and then trade those clams for beef, eggs or milk. He passed on those lessons of Depression-era resilience to his son: Ayres’ father, Lawrence, was a machinist for a pulp and paper company who weathered several worker strikes without pay. To get the family through the lean times, Ayres’ mother, Patty, would make clam spaghetti or clam loaves with canned clams she preserved from previous digs. Ayres’ parents were so dedicated to clamming they continued going until their bodies gave out. His father, who died in 2011 from a neuromuscular disorder called progressive supranuclear palsy, fell over on the beach during a dig in 2009. Ayres said his mother decided at that point that her husband was done razor-clam digging. She continued to go out to the coast for digs while his father would watch from the car. His mother learned she had pancreatic cancer about the same time his father stopped digging, but that didn’t stop her. She continued going to the coast to dig during chemotherapy, though Ayres said that towards the end she needed some help digging up her clams. She died in 2012.